People today are busier than ever and need a product that conveniently allows them to bring along their necessities from place to place. 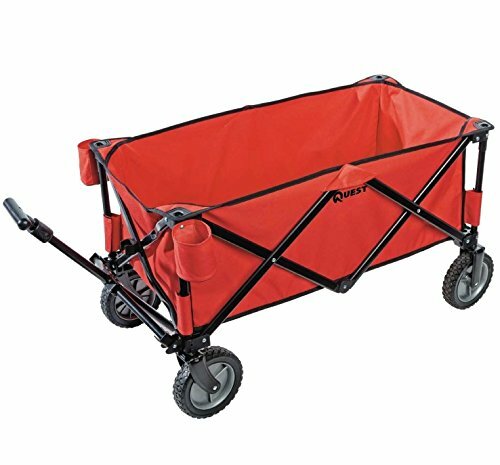 Whether you’re a hockey coach in need of an easier way to carry sports equipment, a savvy gardener looking for a more efficient way to tackle your lawn or a mom who needs lightweight transportation for a day at the beach, this article will walk you through the features a portable utility wagon has to offer. The Quest Portable Folding Wagon is one of many wagons on the market. Its features include a lightweight design made for easy travel and an accordion-style collapsible floor. The floor can be removed and tucked on the inside when storing, eliminating bulk. The goal here is to provide a Quest Folding Wagon Review based on product description, added features, reviews, and pro’s and cons to see if it has what it takes to make the grade. Folds and opens quickly, low maintenance and not overly technical. Telescopic handle allows for reducing length of handle. A lot of products manufactured specifically for travel can be a hassle to store and assemble. If you’ve ever had to fold up a stroller or pack-n-play, you already know why this is one of the most important features to Consider. When products are difficult to use and require two people to disassemble, they don’t get used a whole lot. The Quest Folding Utility Wagon measures at 38.5″x18.5″x22″ and can be compacted to 9.5″x7,” allowing for maximum function while taking up minimal space in your trunk. This product comes fully assembled and ready to go right out of the box, providing low maintenance right from the start. It also includes a storage bag for easy travel.The floor of the this folding Wagon is collapsible and easily folds in half without any tricky levers to maneuver or complicated folding involved. This product also features two cup holders; a huge plus if you enjoy being truly hands-free when you’re on the go. The second feature that separates a product from its contenders is how long it will last. Nothing is worse than buying the same product twice because it was poorly designed. A close look at what features a product offers to ensure longevity is key. The Quest Portable Wagon has a rip and tear resistant canvas made from 600 denier polyester fabric. The canvas is reinforced by a steel frame that folds easily and is sturdy enough to provide ample support. A less noticeable feature includes an upright standing handle. This feature is important because if the handle can’t stand upright without holding it, chances are it will break easily during storage and general use. The Quest Folding Sports Wagon comes in many colors that can be used to the buyer’s advantage. Perhaps you frequently take trips to crowded events such as zoos or concerts; you can select the Quest Folding Sports Wagon in yellow or another bright color.This makes for easy identification in a large crowd. Alternatively, if the wagon is used for hunting, a darker color may be preferred. There a range of colors to choose from. Another feature the Quest Folding Sports Wagon has to offer is sturdy wheels. They allow for easy use in a multitude of terrains. This is important in providing you with the most bang for your buck and giving you freedom to engage in a variety of activities. Easy use in sand, grass, rubble, hay, or rock has all been praised by reviewers. For a product that is designed to alleviate the burden of lifting and lugging heavy or large items, Comfort is another priority high on the list. The user-designed features that the Quest Collapsing Wagon offers are what make it a product worthy of recommendation. The handle is 26″ long, which allows for smooth maneuvering, even for taller people. The handle is telescopic, retracting to less than half its size. This feature allows for a smooth transition into storage, without awkward handles getting in the way. 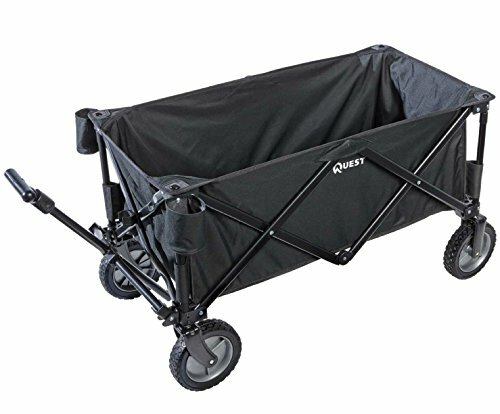 The Quest Collapsing Wagon can support a load of up to 150 lbs, while only weighing 26. This is relatively light for most people, so getting it in and out of storage should be easy. It is heavy enough to withstand strong winds without blowing over but light enough to use without hurting your back. Shoulder, back, and knee pain are all common from strenuous lifting, so a product like this can prevent injury and strain. The Quest Folding Wagon is for just about anybody and everybody is looking for a more convenient way to transport things that would otherwise be difficult to carry. Men and women can both use the wagon. It can be used for sports equipment, gardening tools, and fertilizer, or hauling heavy garbage away. Reviewers have even mentioned using it for selling bake-sale cookies door-to-door and carrying groceries. Trips with the kids to the zoo or beach are made easy with room for coolers and folding chairs. Hauling away tear-outs on job sites is also made easy with the Quest Folding Wagon. The sky’s the limits in terms of versatility. Q: Can kids ride in this wagon? A: They certainly would fit, but it is not recommended. Q: Does the cart push and pull? A: It can do both, but pulling would be more efficient. Q: Is there any risk of the wagon collapsing during use? A: No. The wagon is designed with a sturdy steel frame and support on the base. Q: Does the cart come with a canopy? Q: Is the fabric easy to clean? A: Yes the polyester blend is more stain resistant than other tissues, and is easy to spot clean. A: Yes! Quest wagon parts are available on all E-commerce stores. The Quest Portable Utility Wagon has a lot of solid attributes that make it a good long-term investment. It has many features that allow for easy transportation from one activity to the next. It’s simple mechanics allow to open and close quickly, including a removable floor and retracting handle. Many trips you’ll save yourself back and forth to the car is probably worth it all by itself. Simple yet versatile, to meet all your needs without the hassle that comes from products that are overly technical. Other models do have larger wheels for enhanced terrain function and a scooped shaped handle that is a bit more comfortable but are a little heavier and bulkier. When evaluating what product will be a good investment of your money, it is important to weigh the benefits against the cost to determine functionality versus gimmicks. For an all around durable, functional, and easy to use compact wagon the Quest folding Wagon gives a quality product for a reasonable budget.